There are numerous benefits to squeezing your own juice form fresh vegetables and fruits. In fact, if living a healthier lifestyle is your goal and you would like to start right now, then it’s recommended to get a juicer as soon as possible. Fresh juice is loaded with fiber, antioxidants and vitamins and using a juicer in order to make your own beverages gives you full freedom when it comes to selecting flavor combinations that you love, while also being in control of what you drink. Check out the following tips on what to consider prior to getting a juicer. If you just want a juicer so you can make a fresh glass of orange juice that you can drink at breakfast, then a citrus juicer is the way to go. On the other hand, if you’d like to extract juice from a wide range of fruits, including wheat grass and vegetables, then you should go for a more versatile juicer that can handle both vegetable and fruit juicing. If the juicer you get has a high powered motor, then you won’t need to worry about chopping up vegetables and fruits before juicing them. Also, keep in mind that the size of the juicer is also important, especially if you have a small countertop. If you want to drink a fresh glass of juice every morning prior to going to work, then you need to get a juicer that’s very easy to clean. However, if you can spend a bit more time on making your juicer, then you may be interested in getting a model that offers extra precision and features. Depending on the model you get, some juicers may also come with extra features, including the ability to make soy milk, coconut milk, nut butters and even baby food. Therefore, if you’d like to be able to make these extras at home, then you should look for a juicer that features these extra characteristics. By having a clear budget, you’ll be able to focus on the types of juicers you can afford getting. While it’s true that for very basic juicer you won’t need to spend more than thirty to forty dollars, if you want a top of the line model, then it can cost upwards of 1000 dollars. Speaking of price, it’s very important that you check the features the juicer comes with and see which of them you need and which of them you can do away. In most cases, the more features a juicer has, the more expensive it’s going to be. Lastly, make sure the juicer is very easy to clean and maintain. For instance, depending on the model you get, some centrifugal juicers may require extensive cleaning that can take up to 20 minutes, which is certainly not something most people would like to put up with. After all, no one likes to spend a long time cleaning their juicer after each use, especially if you’re a busy individual. The VRT350X has been voted the Best Omega Juicer by the tens of thousands of people that already own and use it. This is a low speed juicer that’s not only efficient, but also very modern and compact, making it ideal for use in small kitchens. What you’ll probably find most surprising about the VRT350X is that it has the productivity of a slow juicer, yet in a groundbreaking vertical design. The majority of juicers destroy a wide range of vitamins and enzymes during the juicing process, but that’s not going to be the case with the VRT350X. In fact, this model can juice fruits and veggies at speeds as low as 1650 RPMs and as high as 16000 RPMs, meaning that no matter the produce you want to juice, it’s going to be done fast and with no loss of nutrients. The powerful motor of the VRT350X processes the juice at 80 RPMs, meaning that if you want, you can store the juice for up to seventy two hours without having to worry about degradation due to oxidation. There are of course, other features you’re going to love about the VRT350X, including the reverse setting (prevents clogging), dual stage juice extracting system, easy to use cleaning brush, Ultem strainer and auger and 10 year warranty. 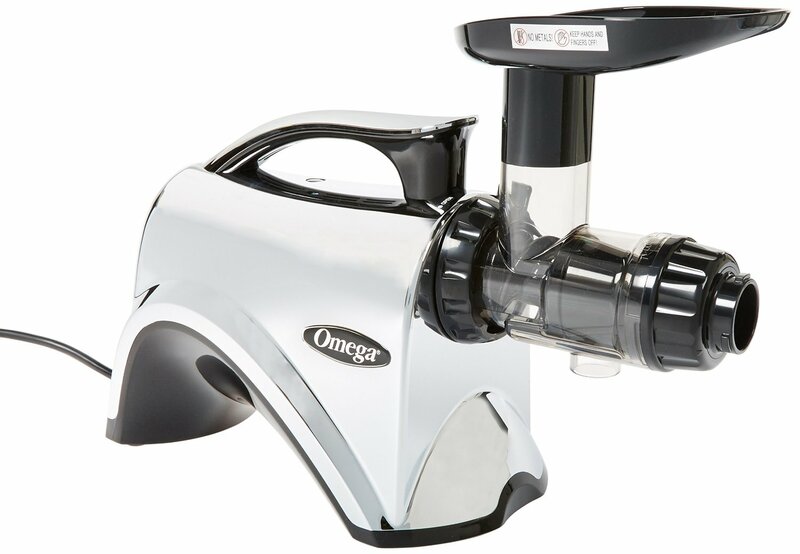 Also known as a low speed juicer, the Omega J8004 is a masticating juicer that’s able to juice a wide range of fruits and veggies at very low speeds without producing heat. The powerful motor is capable of rotating at 80 revolutions per minute, meaning that you don’t need to worry about loss of nutrients, enzymes and vitamins while the produce of your choice is juiced. Because of that, you can also store the juice for up to 3 days without having to worry about it spoiling. The GE Ultem Auger in the J8004 is very durable and it’s in fact up to eight times stronger than the majority of other plastics. Speaking of which, the gear inside the juicer is the equivalent of 2 Horse Power motor and given the fact that the juicer employs a dual stage processing system, you can have the peace of mind that the pulp is going to be bone dry. If you want, then it’s also possible to use the nutrition center in order to mince garlic and herbs, spices and coffee beans, extrude pasta, whip up soy milk and also make baby food. 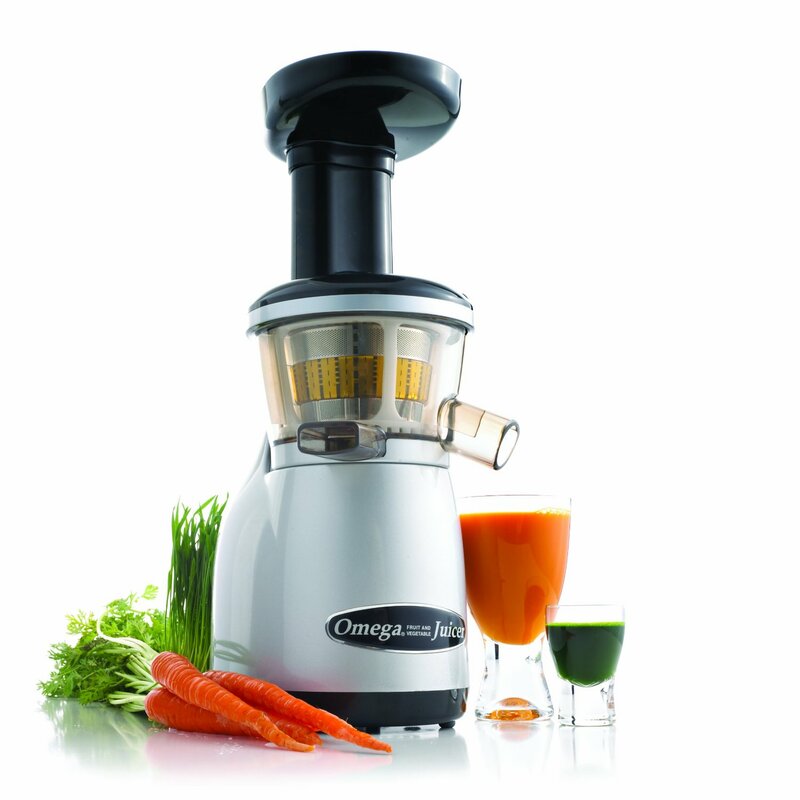 All in all, thanks to its powerful, quiet operation, but also ease of use and high juice yield, the J8004 is by far one of the best juicers on the market today. If you’ve ever wondered about whether a juicer that’s able to extract the maximum amount of juice from your produce without destroying essential vitamins and enzymes in the process exists, then you now have the answer. 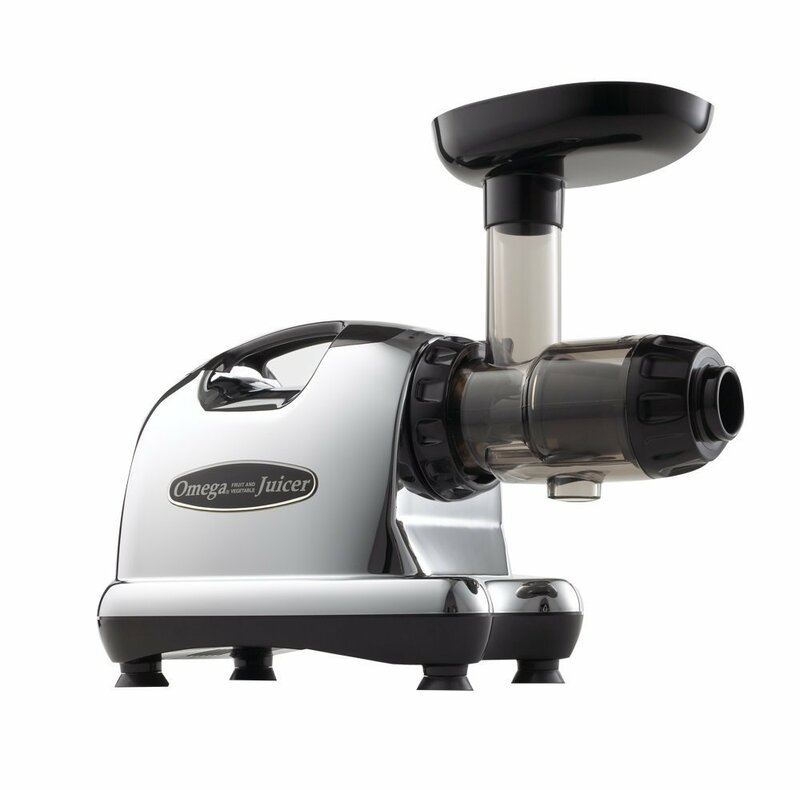 The Omega J8006 is a masticating juicer that runs on a powerful motor that’s able to process fruits and veggies at a slow speed of 80 RPMs. If you’re not new to the world of juicers, then you’re probably aware that the majority of other juicers can process produce at speeds ranging from 1650 and up to 15000 RPMs. The great advantage of low speed produce processing is the fact that the healthy enzymes and vitamins in the juice are preserved, so you can make healthier and more delicious juice that can be stored for up to 3 days in the fridge without degradation. 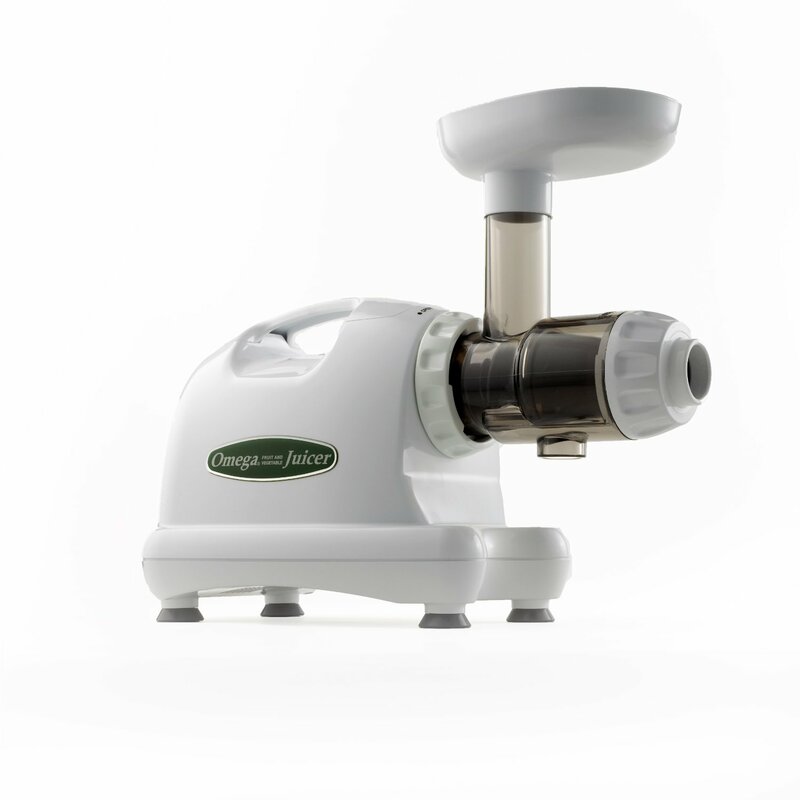 The Omega J8006 features a GE Ultem auger that’s up to eight times stronger than the majority of other plastics and given the fact it features a dual stage juice processing system, you’ll be able to get maximum yield from wheatears, leafy greens and all other fruits and veggies. The juicer has a small form factor and since it’s eighty point five inches tall, fifteen point five inches deep and seven inches wide, it can be easily used in kitchens with small countertops. Better yet, unlike other juicers out there, you can also use the Omega J8006 in order to make baby food, almond milk, soy milk, nut butters and a wide range of healthy snacks. While it’s true that the juicer operates at 80 RPMs, it may produce a bit of noise, so if you’re unhappy with even that tiny amount of disturbance, then you may want to place the juicer on a towel to mitigate it. In terms of warranty, Omega offers a 15-year warranty for the J8006. The 6th generation of the NC900HDC seems to have a lot of fans and that’s because this juicer is unlike many others currently on sale. First of all, the juicer has a powerful 150W motor that’s able to spin at 80 RPMs, making it easy to juice many types of fruits and veggies with zero loss of nutrients and vital enzymes. Thanks to the auger system, the produce is forced into a tight chamber where it’s grinded and then pressed in order to ensure that even the last drop of juice is squeezed out of it. From leafy vegetables to wheatgrass, you can rest assured that the NC900HDC is able to handle all of them with ease. But that’s not all. While most other juicers will only help you make juice, the NC900HDC can also make a variety of healthy snacks, but also almond milk, soy milk, baby food and nut butters to name a few. Given the fact that the feed chute is also larger, you’re going to spend less time preparing the produce for juicing, a time advantage that many people are going to love. There are many other features you’re going to love about the NC900HDC, including its quiet operation, built-in handle, continuous juicing with automatic pulp ejection, six nozzles and one juicing screen and BPA free parts. VRT350 juicer is one of the most efficient, vertical design masticating juicers you can currently get. Also known as a slow juicer, the VRT350 is able to juice a wide range of fruits and veggies at 80 RPMs, meaning that nutrients, enzymes and vitamins are preserved during the juicing process. Speaking of which, this model features a dual stage juicing system which guarantees that no matter if you would like to juice wheat grass, leafy greens, vegetables or just fruits, it’s going to extract the maximum amount of juice from them. The patented screw design of the auger the VRT350 incorporates is a lot more efficient when pressing and also squeezing produce in order to extract juice. Compared to other models out there, the hopper is located at the top, making it very easy to use. Depending on the ingredients you want to juice, you’ll find the included pusher to be very useful at times. The VRT350 features two sixty-four oz containers, with one of them being for pulp ejection and the other one for fresh juice, but also 2 spouts. Before changing ingredients, it’s recommended to clean the juicer. The cleaning process is actually very simple and all you need to do is pour water through the chute and allow the juicer to do the rest. When it comes to the top Omega juicer on the market, we have to give it to the VRT350X for being an excellent juicer that’s not only very simple to use, but it also helps you make some of the most delicious and healthiest natural juices you’ve ever had. First of all, it’s important to take note that this is a slow or masticating juicer, meaning that unlike its centrifugal counterpart, it won’t cause any loss of nutrients, vitamins or enzymes during the juicing process. That’s because instead of spinning at high speeds, it spins at 80 RPMs while pressing and squeezing juice out of the produce of your choice. What you’ll probably find most surprising about the VRT350X is that it has the productivity of a slow juicer, yet in a groundbreaking vertical design. It’s also important to note that the VRT350X has a compact design, meaning that regardless if you want to use it in a kitchen with a small countertop, it’s going to take up very little space. 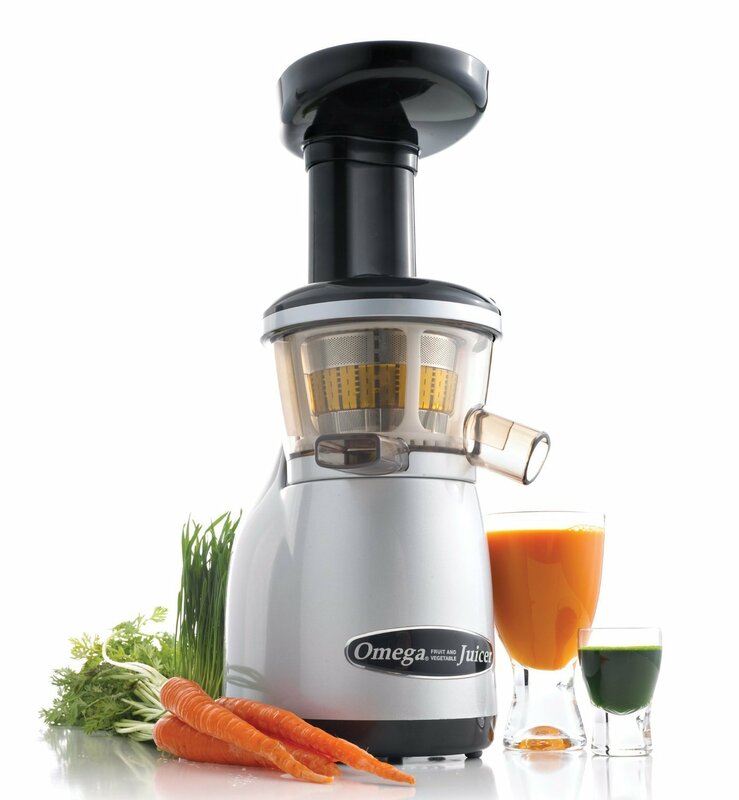 However, besides the obvious characteristics that make this juicer the best model Omega has ever released, there are other features you’re going to love about it, including the reverse setting (prevents clogging), dual stage juice extracting system, easy to use cleaning brush, Ultem strainer and auger and 10 year warranty. Thanks to its great build quality, revolutionary juicing system, but also great ease of use, we fully recommend the VRT350X to both juicing enthusiasts and juicing novices. Previous Previous post: The 5 Top Juicers from Kuvings Reviewed – Goodbye Aging, Hello Good Health! TheHomeSavant.com is a participant in the Amazon Services LLC Affiliate Program, an affiliate program designed to provide a means for sites to earn advertising fees by advertising and linking to amazon.com.